When we received the news that our son, Noah, was born with Down syndrome (we didn’t have a prenatal diagnosis) one of the first things my wife and I tried to do was figure out a way to take the pressure (and awkwardness) off our friends and family by sending out a “spoiler-alert” blog post. I think it helped break the ice, and helped our friends know it was ‘ok’ to talk to us about the news of our son’s extra 21st chromosome. 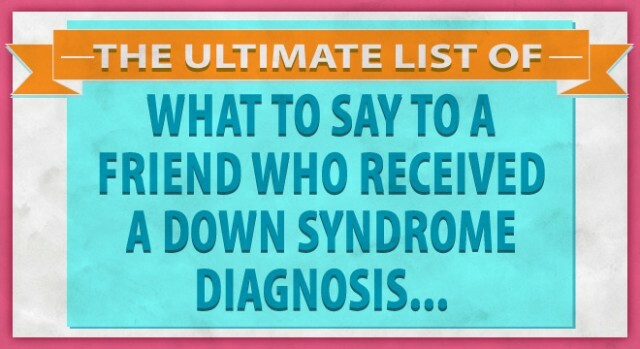 Do you know what you would say to a friend who has just received a Down syndrome diagnosis? One of the effects of the recent changes in the ACOG’s guidelines is that more and more women will receive a Down syndrome diagnosis. In fact, you may have had a prenatal Down syndrome diagnosis yourself, or known someone who has. What would you say to someone who just received a Down syndrome diagnosis? What I got in return was over 300 suggestions of things to say to someone who just found out their little baby will be born (or was born) with Down syndrome. I’m posting all of the comments just as they were submitted, and you’ll see was quite a variety of responses. I hope you find the list encouraging, helpful, and hopeful! By the way, be sure to leave your email in the box below and stay up to date with our newest posts. Angela: You can do it!! Amber: You have just been blessed with a child that will always love you, amaze you every day, and never stop making your life better. Amie: They are one of the lucky, choosen few Blessed by God! Amy: Congratulations! You are very blessed! Nigel: Down syndrome today is not the Down syndrome of yesteryear. Michael: Blessed !!!!!!!!!! You may not know it or think it YET , but you are and shall always be Blessed !!! Maria: You have been blessed. Chisato: your child is PERFECT just the way God mad him/her! Don’t let any one else tell you different. Michelle: You will be surprised how it turns out. Much different than you are thinking. Your baby will be a child just like all other children. He or she will have some limitations but you never know what those will be with ANY child. Pray for your baby and love her (or him) with all your heart. It will be YOUR BABY. And a child of God. Kim: God is in control. Jemma: Congratulations! Your beautiful baby will amaze you everyday. Each little milestone will make you the proudest parent ever! Mary: You have been chosen to receive a true blessing from God. Lizette: I know your are full of worry now but once you have your little baby in your arms you will wonder why you spent so much time worrying. It will be beautiful!! I have had 5 months of beautiful in my little man Lucas and I woudn’t trade it for anything! Mary: Thats hard to say, I guess it would depend on the persons with the child. love lots of love !! Julie: Congratulations! A beautiful baby to love!! Noah: Nothing gets in the way of a parents love for their child. No mental or physical issues are goin to interfer with how you love & care for your child. Martina: CONGRATULATIONS!!! Your life will never be the same again, it’s about to get better. Micah: I’ve always felt that God puts people with Down syndrome on this Earth to show us how to love. Jesus loves people regardless of size, color, or wealth, and I think that people with Down syndrome exude that love down here on Earth! Jeannette: This baby will be the best thing that ever happens to you. Your strength when you’re weak, your affirmation when you’re vulnerable, your motivation when you’re weary. Life is always beautiful, no matter the circumstances. Allison: You loved your baby before you knew it had down syndrome. Nothing has changed. Your baby always had down syndrome. And you will always love him/her. Kimberly: It’s not a death sentence and it’s not the end of the world. And it’s not your fault. Your eyes are about to be opened to a whole new world. This child that you are bringing into the world is a gift from God. This child will teach you to stop and appreciate the little things in life, to celebrate small accomplishments, and to laugh and love from the bottom of your soul. It’s not always an easy road and you will have to be a warrior advocate for your child, but the journey is worth it! Shannon: You will be OK. You’re going to be on an emotional roller coaster – but the ride ends with a beautiful baby in your arms. I cannot believe how much I cried before my baby was born – and how she has amazed me every day since. Maureen: Don’t be afraid. There will be challenges- but the joys will far outweigh them!! Debi: U about to receive Unconditional Love, what a blessing!!! My Rylee is 10 and has brought so much joy and love to my family and I and also my friends!!! It’s a wonderful world!!! Kenneth: Take a deep breath and exhale. It will all be good! Julie: ‎…everythings for a reason..It may not be the path YOU would have chosen but it doesn’t make it a bad path either..just a different journey. Paula: This scare will pass and it will turn a lot of joy. Candy: Congrats on the bundle of JOY! Jennifer: ready, set, GO! Life is going to get interesting, never boring, tons of fun and filled with blessings!! Stormie: in for the most amazing adventure ever!!!! Congratulations!!! Sara: Science has come so far and he/she will be quite a challenge but a great blessing. Anything is possible. Bea: Don’t be afraid to ask for help and don’t be afraid. Mary: No one comes with a guarantee stamped on our backside. This child will have all of the challenges and unknowns as every child. And NEVER let anyone tell you your child will “never…”! (At 30, our Mollie has proved every one of those nay-sayers WRONG!! And we couldn’t be prouder!) There are many who have traveled this path before you and we will be here to hold your hand and lift you up as you join us. We understand. Jodi: They thought my little rylee was going to have Down syndrome cuz the tri screening came back positive..I was prepared but she didn’t have Down syndrome when she was born, now she is 3 and half and found out this summer she has autism..she is def my little blessing…any child with or without a disability is a true blessing! 😉 and god has picked u as their parents for a reason! Naomi: Congratulations…you are about to learn about and feel unconditional love!!! Angel: have patience. just wait and see. Mandy: God has blessed you with a Child… That is the most important responsibility that he could bestow on you! He knows you and believed that what ever blessings he sent your way you would be the perfect parent to his gift. All this diagnosis tells you is what a miracle you are carrying inside you and the second you hold that little miracle in your arms any fears will just vanish and the love of your child will give you all you ever need. Rhonda: it may bea differnt journey, but your life will be filled with unconditional love! Leanna: CONGRATULATIONS! Gather your support system and enjoy your new baby! Julie: Open your eyes and see the baby that needs and loves you! Amanda: You don’t know it yet, but you will love this little guy/girl more than you can possibly imagine and he/she will be one of the most amazing people you’ve ever met and you will smile more than you thought possible. But it’s ok to mourn the ideas you had in mind but mourning doesn’t last forever and when you see him/her smile, you’ll see the light of the world on that face! Patricia: I know you are scare and mad am here to help you. I was in your shoes not so long ago. This is my baby Angeleque! Joleigh: the same thing I say to everyone who is pregnant with any baby. Congratulations! This child will bring you greater joy than you could ever dream possible. Heather: You get to decide how you want this to go. You can either accept it as a blessing and enjoy the life that is waiting for you or you can mourn what is NOT a death forever. Your choice. Leslie: Remember that God has picked just you for this special gift to love and take care of. Maren: I know you’re devastated and mourning the loss of what you expected, but your love and joy in this child will amaze you. You may be disappointed now, but you will soon feel very lucky. This child is a blessing to your family and everyone else in your lives. I am humbled that God gave me such a unique gift. Melanie: You may not realize it yet, but you are so blessed!!! Your life is going to change and while change is scary…this change will open your eyes to a world more beautiful than you can ever imagine!!! Danni: Amazing, beautiful, loving, funny, and perfect no matter what they have or how they look! Erin: I know this isn’t the road you would have taken, but remember that when we follow the unfamiliar road is where adventure and the greatest moments of our life happen. I’m not saying this will be easy, but it will be rewarding in so many ways. And, I still get to be first in line for babysitting. Cathy: congratulations and embrace it with eyes wide open, you will have an amazing child!!! Jennifer: That your baby will be a baby. I know that sounds silly, but, they will do all the same things that any other baby will do. They’ll eat, sleep and poop for the first few months, they will smile and laugh, and rollover and crawl and walk. Just in their own time!! 🙂 Enjoy it, it goes by way too fast. Stacy: try to focus your energy on what you can do – educate yourself/selves, gather information, supportive people and services… and try to steer clear of worry. It is wasteful and helps no one. Regardless of any diagnosis you are still HAVING A BABY! Yay!! Melanie: Congratulations!!! Get ready for the GREATEST Blessing in your life!!!!! Teresa: Congratulations, you are raising a Saint. Bobbie: You have been blessed! ElAnn: You are blessed beyond imagine. I know it can be scary thinking about it, but once that precious angel is in your life you will wonder why you were ever scared or anxious at all. This bundle of joy will change your life for the better more than you will ever know…you are in for the best and most rewarding ride of your life! Kimberly: Raising any baby is hard, but, I don’t have any doubt you can do this. We aren’t given anything we can’t handle and the resources and opportunities for children with different abilities are endless! Enjoy the gift you were given! Suzie: Please don’t abort your child. If you aren’t willing to accept your precious blessing there is someone that will. Jennifer: ‎…just wait and see. People’s ideas of what the diagnosis means and how they will feel once they hold their baby are often worlds apart. Tina: Welcome to Holland!!! Not the trip you might have wanted….but it will be the best trip you will EVER go on!!! Tenielle: ‎”Would you like to talk things over?” and “I can give you some resources to help you adjust to such an unexpected result, do you have any questions?” I’m a student doula (birth attendant) so I may well have to deal with this situation with a client someday. Sarah: I know the unknown can be scary, but your heart will be so full of love for this child. You may not realize it until they are actually born, but they are a precious baby like any other! Enjoy! Callie: God has an incredible story for you and your child’s life – consider yourself blessed that he has entrusted you with such a gift and look to Him daily for wisdom. He loves you and your child more than you know and this is no surprise to Him, He knows what He is doing. You will find that there are so many incredible things to be thankful for in this journey. Get ready to receive more joy and smiles than you thought possible! Charlene: Congratulations! You have been blessed with the most amazing gift! You are about to experience unconditional love in the true sense of the word! Kayla: Congrats on the blessing, god woudnt have givin u a blessing you couldnt handle. My mom has 6 kids one with Down syndrome and she said and i qoute ” just when you think you know everything you need to know in life, god shows you just how mush more there is to know. Shelley: This is for the family members and friends DO NOT say you are sorry to hear the diagnosis, they are special angels from Heaven and only special parents get to have these special angels, family members and friends should be REJOICING and saying oh my how BLESS you are that GOD chose you to be parents to these special ANGELS! Jeff: Congratulations you are about to have the most wonderful child you could ever ask for. Ann: Thinking back when i found out.. after little dude was born the last thing I would want to hear is ‘congratulations’ I think I would tell a person that being upset is ok.. that most if not all of us parents go through it. we morn the ‘idea’ of a perfect baby..and once we get past that we learn what Down syndrome is all about. Yes it is different, yes it is challenging, yes it is rewarding.. yes my little dude is the sun that shines in our house. But all of that comes in time.. it comes with educating myself.. with leaving my expectations behind without leading by my own selfish perceptions..giving up a bit of control and sacrificing a whole lot at times. But that is what being a parent is after all. I would seek to arm that person with information and positive examples of what Down syndrome is. Stacy: God shares his blessings with us in many different ways! Wesley: what a wonderful experience you about to begin. Diane: Congratulations! Your baby is 101% awesome! Cindy: In God’s eyes, all children are created perfectly for the job He has put them here to do. Lorie: My sister in law has a daughter with cp.She is beautiful and a source of joy for us all/I don’t know what I would do with out her she is the special stuff in life and a true joy.We were so scared when we all found out but she is just part of the family that we love and adore every dayMy mack. Andrea: A meeting was held quite far from Earth! Vicki: Congradulations!!! This is going to be AMAZING!! John: your whole family will benefit greatly from what this person teaches them over the course of their life. so, i’d like to say congratulations, good luck.. and welcome to the tribe! Tracy: Rejoice in the fact that you were able to have a child, not everyone can. Remember God picked you for this special life and it will amaze you every step of the way. Beverly: Congratulations! You’re about to receive blessings beyond you imagination! Edie: Embrace it. Love your child with all you have. This is not the worse thing that could happen…..trust me. Susan: They’ll be a lot of medical issue’s to deal with but so worth every minute being with your special little one! Kayla is amazing at all the things she can do and a whiz on the computer! Mary: Trust in yourself as a parent and believe in your child. Erika: Labels do not define your child! Love will lead the way!!! Amy: Your child is a precious gift from God. You are going to be blessed way beyond what you can measure. We know this to be true because we went all the way to Ukraine to adopt our two angels who have Down Syndrome. How wonderful it must be to carry an angel in your womb! Carole: Congrats and enjoy, you have a special little gift! Stacy: Congratulations! You are about to experience more Love than you ever thought possible! Justin: go ahead and mourn that idea you had of your baby, its necessary. Don’t feel guilty. Then look at your baby as a baby and not a down syndrome baby. The sooner you can look at them as who they are and not a catagory the more you will get to know them. I can’t tell you how many days pass and Ella’s diagnoses never crosses my mind.. Even with therapist and doc appts I still don’t think of her DS. Usually someone has to say it then I’m like of yea she does have DS. Just remember your baby is a person first. And Pray a lot! Deborah: Welcome to Holland. It’s a fantastic trip. Stacey: Using the words someone gave my son when they learned of their daughter’s diagnosis: “You won’t be sad for long”. Sandy: You might not know it yet but you are about to be blessed with this very special little angel! You will not know it yet but you will love this child more then words can express!! Natalie: Prepare to be loved! Sylvia: Stay away from the people that want to talk about the negatives ,surround yourself with sites like this and people who know the true joy of having one of these children in their lives. Do not set limits but rejoice in every accomplishment no matter how small. Last but not least prepare to experience the most awesome form of love and joy you could ever imagine. Anna: Congrats! Get ready for one of the best times in your life! Patricia: Welcome to Holland for sure! It’s an absolute beautiful place to be!! Alana: Mourn your loss and don’t feel guilty. But soon, you will be able to see your child and I promise you will see so much more than down syndrome. Susan: Allow yourself to grieve for the child that might have been, then allow yourself to rejoice for the child that will be. My David has been the greatest blessing of my life. I LOVE being his mom! John: It can be a challenge but who said life should be easy.. This is your chance to make a real differance and no matter what you will forever love your child Tri-21 or not. Do your best to be a great parent and you will have a great child and happy life. Tara: That we Indeed are the lucky ones!!! Sandra: Congrats on ur new bundle of JOY. God sent u one of his special angels that only a few are chosen for this huge responsibility. My son is 13 now and he’s my world. Miranda: Welcome to the family!!! You will never have a dark day again b/c your child will light up even the darkest room with their smile. It will be absolutely amazing!!! Tregg: Its good to see, judging by the responses here, that I was not the only one caring around a lot of guilt for my sense of loss immediately after my daughter’s diagnosis. That was over 2 years ago and I still feel ashamed of how I felt that day. Lora: I know you don’t believe this, but trust me, one day you WILL find yourself saying “it’s only Down syndrome”. Patricia: It’s okay. They are unique and belong to a loving community of caring, carrismatic people. Bonnie: To God be the glory! Ellyn: My OBGYN said the best thing to us and he was SO right! He said we would find this to be a blessing for our family. Our son has blessed our lives in so many ways and we wouldn’t change him! Denise: I wish I had had someone who had some good advice for us when I got the prenatal diagnosis that our baby boy Avery has Down syndrome. It was the scariest time of my life…worrying about the unknown! We got the diagnosis just over halfway throug my pregnancy & I was absolutely terrified! Avery is now 15 1/2 months old, absolutely beautiful in every way, super smart & the joy of our lives…& I couldn’t imagine another second of my life without him! I still get so upset when people find out he has Down syndrome & say “oh sorry” or “that’s too” bad! Yes…I’m sorry the aren’t lucky enough to have been blessed with a child like him! He is totally amazing in every way & my husband & I consider ourselves very fortunate to have been chosen to be his parents. Jenny: Congrats and Welcome to Holland!! Edie: The neonatolgist told us “he will be the light of your lives.”. And even after his death, he still is. Ruth: Take it one day at a time. He/she will be a baby and need live and everything a typical baby would. Expect cycles of being happy and mourning the loss of your dreams for a typical child. It may come in waves. Know that it WILL get better and you’ll find sometimes you may wish all your kids had down syndrome because they can be so sweet/easy to be around. Try not to idealize or feel guilty bc of those who do. Surround yourself with friends who’ve been there to encourage you. Laura: Don’t worry – everything will be A-OK! Alex Mandara: He or she is down but not out! Regenia: Take things one day at a time. Don’t focus so hard on the future. Lisa: The scary parts aren’t as scary as you think they will be. The joyous parts are even better than you think they will be. Everything will be better once you can hold your sweet, loving, beautiful baby. Have faith that god wants this baby to be with you for a very good reason. Erin: Congrats! You are one of the lucky ones! Kari: I haven’t met my baby yet, but the best piece of advice I have came from my genetic counselor. This is especially important for a first-time parent like myself. Your baby is more like other babies than not. Don’t overwhelm yourself with all the information out there about Down Syndrome right from the start. Read your baby books first! Celebrate your pregnancy. And by realizing that this is not the worst thing that could happen and that you will love your baby no matter what, stay positive – and others will follow your lead. Bonnie: Oh how exciting…..you are in for the most blessed life ever!!! Yes, there will be good and bad days ahead but it is true with any child….you will learn so much from this child and your lives will be so much richer!! Place this precious one that God has given you charge of in HIS hands….Jeremiah 29:11 For I know the plans I have for you,” declares the LORD, “plans to prosper you and not to harm you, plans to give you hope and a future. Jennifer: Let’s get learning so we are ready for your amazing baby! Cortney: What an honor, you get to be the parents of one of the most pure human beings you will ever know! Courtney: Welcome to the way life should be! This child is going to overload your heart with love & pride! Christine: The same thing that was said to me when our son was born (unexpectedly with DS): “Do you realize how blessed you are?? God has chosen YOU to take care of one of His most special angels here on Earth. The joy that lies ahead for you is unimaginable.” Didn’t believe it at that moment but I stand here – 6 years later – and say “Amen! Thank you, Lord for the blessing of my son!” He is like having a glimpse of Heaven here on earth. Christopher: You will never how lucky you are! Only special people are chosen to have special children!!! Jennifer: Congrats! You just hit the lottery of love! Lorrie: You are so blessed! Amy: I think the worst thing that I was told and have read many times is “it was just a fluke.” cause who wants to hear that their baby is a fluke?? It made me feel so guilty!! I don’t believe in accidents and I know that no one, no matter their diagnosis is a fluke! Every person is beautifully and wonderfully made. I wouldn’t change anything about my little guy or my other kids for that matter. And yes, it really is just down syndrome. Every single one of us has our challenges and special needs, no one is exempt. Our children our awesome and made perfectly! Amy: Ditto on Jeremiah 29:11! Carol: Have you seen Noah? He’s so friggen’ cute! Chasity: I know you are scared and a little sad but believe me when I say EVERYTHING will be OK!!! You will love your baby so much! When that baby smiles up at you, you will know “I LOVE MY BABY”. Melissa: Psalm 138:14. ” I will praise You for I am fearfully and wonderfully made!!! !” God doesn’t make mistakes. This is a blessing not a punishment. Wait until you see how much richer your life is about to become! Renee: Love that baby as you would any other, don’t focus on the diagnosis, meet other parents with children with down syndrome and get 1st hand knowledge and please know that people with down syndrome are more like people with out down syndrome than they are different. I would also say congrats & I’m here if you need guidance and support. Ange: Remember first and foremost that you are having a beautiful unique baby, feelings of grief,despair,anger,loss are natural…and medical staff often paint a negative picture but be brave and make an informed decision regarding your pregnancy, talk to another parent and/or find a local support group. And from a mum who has walked the path of having a prenatal diagnosis…my son changed my life in the most profound way before he was even born and now at almost 2 years old he amazes us every day, if only every family had a child with Down syndrome…we are fortunate. Melissa: Psalm 139:14 not 138. Ahhh typing from an iPhone! Luz: God knows what He is doing, trust Him with all your heart. When I knew Ariel had ds before he was born I felt lonely and sad but I loved the Lord and decided to accept His will. God has never failed us, He promised to provide for Ariel’s needs and it has been that way since. God uses Ariel to bless me and all who surround him. Just trust Him, your son/daughter will fill your life with love and miracles. Ana: First, congratulations! You’re goingt to have a baby and you’ ve to love him/her the same you would do without the extra chromosome. And second, expect the unexpected… Nobody knows what are going to do your child! Audrey: Hang on and welcome to the ride of your life. Fun, scary, frustrating, but so worth it. I have been on this ride for almost twenty years and not regretted a single moment. Stephanie: Don’t freak out!!!! You’ve been given a gift that will bring you joy like you have never known before! Above all protect him/her until they are born, then hold your child like the treasure they are. And never let them go! Joan: God sents us these angels for a reason.When you see the happiness that shines from their eyes you know why.We thank God for giving us our angel. Kevin: Congrats! You are about to become parents of amazing child. If you have other children, I recommend this buying this book “We’ll Paint the Octopus Red” by Stephanie Stuve-Bodeen. Lori: Congratulations. You have been chosen to be the parent of a very special an unique child. You will learn many things about life from this little miracle. Laura: God is in control! Lori: I would first tell them Congratulations! And how wonderful it is to have a Down Syndrome child! Then I would advise them on the books I read, and tell them to reach out to their local Down syndrome organization to talk with other parents. Regina: Congratulations! Don’t be sad. Enjoy your baby! Jennifer: I would congratulate them and encourage them to let themselves feel whatever it is they are feeling….they’re entitled to take some time to wrap their heads around all of it…learn what it means. But then I would advise them to not let their fears of the unknown take away from their joy in the present. I’d tell them my biggest regret was wasting a single minute being sad in the beginning instead of just soaking up and enjoying every minute with my baby. Kim: you said would I would it is great advise I do tell parents they will have a normal a different normal than you thought but a normal just the same but to me the grieving part is very important so they know it’s ok to feel that way than you will feel more joy than you think possible!! Lexi is the joy of our family I can not imagine life without her in it!!! Anisha: Just don’t forget that you have to give the new parents some time and space give them the resources they need and let them know you are there….. but don’t be to pushy in the beginning it really is a lot to take in.. give them a few days before you reach out to them again and just let them know that you have material that will help answer questions and pre peace them for the journey they are about to embark on. Stephanie: congratulations–you are about to know love and blessings beyond measure! Cheri: One day you are going to realize that you are one of the lucky ones. My daughter is nine now and I am so thankful that God chose us to raise her! She affects EVERYONE she meets! We are so lucky to have her in our family!! Don’t worry! Jeannie: WOW!!! Are you ready for all the Love!!!! Ellie: Congratulations! You are lucky to have this baby. Someone actually said this to me, instead of saying how lucky this baby will be to have you. She was absolutely right, I was! Leslie: Tests don’t determine level of functioning. Learn everything about hypothyroidism, subclinical hypothyroidism, and T3 hormone you can. Don’t accept the words “That is just Down’s.” You are probably grieving a stereotype and you will find that your baby is far from what you grieved. Placing stereotypical expectations sells God and your child short. You will be amazed at what they both can accomplish. Wendy: Before a genetic counselor gives you their grim prognosis, arrange to meet a child with Trisomy 21 and you will see how blessed you are to be one of the chosen ones. Mishayla: Congratulations!!! That was something that was not said to Tony and I!! Mike: Congratulations, you have won the jackpot. Meredith: I would tell them that their baby is a wonderful little blessing and that they are on the most wonderful and amazing journey. Just make sure to keep God in the driver’s seat! Donna: You will have highs & lows; will grieve & rejoice; will laugh & cry! I am only the great-grandmother of a child with down syndrome but I cannot imagine our life without her! It won’t always be easy; but will be a blessing that you could not have dreamt of before your baby arrived!! Darla: AWSOME!! God has just blessed another family with another ANGEL, wow you are so fortunate to have been chosen to experience so many joyful moments too such a wonderful perfection of Love , laughter, and yes lots of new beginnings, so happy for you.. Congratualations!!! Allison: Try not to worry, you are embarking on the most incredible journey, enjoy every minute! Stacey: So many doors have been opened because of other children/adults with Down’s that I can’t wait to see how many doors your angel opens! Congratulations on your bundle of love and joy a true gift from above! Kelly: WooHoo! (And I’m serious…I love them so much!!! Kristina: You can do this!! Accept that the journey with this baby will be different and wonderful!! Kelley: I would say congratulations and welcome to the elite club. You may feel alone, but you are not. Do not feel guilty for being upset, worried, etc. because we’ve all been there (whether pretnatal diagnosis or at birth). Enjoy every moment of your pregnancy because you will miss it 🙂 You will get more support than you expect and will be surprised by many wonderful people along your journey. God will put many new people and opportunities in front of you. There will be good days and not so good days. Reach out for help when you need it. Most of all, ENJOY YOUR BABY!!!!!!!!!!!!!!!! Tammy: I would advise you to first grieve the child you had imagined and then thank God for the blessing of this special child who will bring you more joy than you ever thought possible. Raising Riley: Children with down syndrome can do anything a typical child can do, it just may take longer and it may happen differently, don’t research until you’ve had a chance to adjust, visit Noah’s Dad blog and wonderful FB page and…ENJOY YOUR BABY! Kristin: There is nothing to “mourn”. These babies are just like every other baby..they just have a little something extra! Jaci: Its the best “worst” thing ever!! Its ok to be sad and feel a loss…we all did…..but you’ll get past that when u see how fearfully and wonderfully made ur lil miracle is! Amber: don’t be scared. this baby will be the best thing that’s ever happened to you, i promise, because he/she is an angel in disguise. you’ve been given the gift of being able to see the world in a brand new and beautiful way. Cathy: Congratulations!! You’re having a baby!! Corinne: I would say congratulations on your beautiful baby. And please check out Noahsdads page on FB! Brenda: How exciting! You’re having a baby! Catrina: Congratulations on your baby!!! Shona: Meet a baby and as many parents as you can before you go on the Internet or make a decision! Alyssa: My older sister has Down syndrome and when a friend of mine’s baby was born and the doctors weren’t sure, but thought her baby possibly had Down syndrome, I asked my mom what to say. She said, “Rejoice with her, for a baby has been born! Cry with her, because life will be different than she expected and there is (and needs to be) mourning of the expectations.” I thought those were very wise words. Marta: see your child, always. not the down syndrome. Kirsten: Everything’s going to be alright! Just prepare for a baby! Grace: You are about to bring an amazing child into the world. Can I babysit? Wendy: The sun will rise again and this time it will be so much brighter! You are blessed! Charlene: Don’t panic, it will be okay! Lots of challenges, but also many blessings. Maureen: Yours is not a story with a sad ending; it’s the beginning of a different kind of story – a wonderful one with sooooo many blessings!!! Elaine: God has chosen you!!!!! Byrd: my brother has downs I think ups would be better description you’ll never know anyone with more love and sweetness! Jeanie: What a blessing! The Lord has matched you with this child to love one another!! Casandra: congrats!! you are a lucky mummy 🙂 dont be scared and enjoy!!! Lydia: Dream big! This is a new generation of kids with Down syndrome, and they are knocking the socks off of everyone’s expectations. Denise: It’s ok to be scared and it is ok to be sad…but when you lay your eyes on your beautiful baby you will soon forget what you were so scared and sad about. You will truly feel nothing but pure joy. Carol: It’s a wonderful life. get READY!!! Meri: love with all your heart and you will be rewarded with the unconditional love only a child could give! Congratulations! Rebecca: congratulations and welcome to the family.. you are now going to be part of a very select group of parents. Read the books, talk to the professionals who will explain the science of down syndrome and then listen to your heart. God gave you this precious baby. Andrea: God only gives us what we can handle. Enjoy your baby! I don’t have a child with down syndrome but would welcome one in my life at anytime! Stella: Congratulations! If you need someone to talk to or need help, I’m available. Helen: You will now know the most amazing gift of love sent down from God. Hold on it will be a great ride. Jane: What awesome gifts are babies are. Others will be jealous 🙂 they are not down syndrome. They are people who have down syndrome. It’s not a disease !! Lori: To go to noahsdad.com!!!! Kathy: that child will be the most loving human in your life. Kristen: ‎”I love babies!! !” My dh and I decided we were NoT interested in this type of info at all with either of our pregnancies! No tests for us! We wanted a family! Renae: congrat!!! u are about to bring one of Gods angels life!!! Sarra: You will soon see that you are one of the lucky ones! Only a select few get this special privilege. Congratulations! Pauline: It’s gonna be ok, go ahead and cry, and wonder why this happened, but when you hold your beautiful baby for the very first time you will have so much Love and understanding and say,… I will be their for you always!! Paulette: Everything will be OK. Now hang on for a wild ride! Laura: If everyone could view the world through the eyes of a down syndrome….WOW, what an awesome world it would be!!! Stacey: Its just a different journey than you had planned, but it is what you make if it, and it can be amazing, them most wonderful journey one can be on….. Difficult, stressful, and full if joy, amazing, wonderful events await. You….. Enjoy the ride!! Emily: Congratulations!! You are blessed. There may be challenges but the joy and love outways any challenges. You will learn to see life in a whole different way; a good way. Hug and kiss that baby and you will get tons of love and happiness in return. Joy: get ready to get your socks blessed off! Stephanie: You are blessed by God with the sweetest child….a treasure from Heaven!!!! Susan: your life is about to change and it will be for the better! The love that is shared through each family member with your new baby, will enrich each person that that family member crosses throughout their lifes! Michele: Congratulations! You’re baby is beautiful! Miranda: I feel good, not just because my daughter is doing great, I feel good because now I know I am not alone, I feel love in every post I see here, since my baby was born I see life from an another perspective,I feel more mature and stronger than before, and God bless my OT to gave me the link of Noah’sDad. Thanks to all of you because I think we are special people living with angels ! Sarah: its a road not everyone gets a chance too travel and its one with alot of bumps and potholes but none too big you cant get thru…. and the ride is the most amazing as long as you allow yourself and child extra time too enjoy it!!!!!!! 🙂 its been a fun ride so far for our family i hate using the word blessed its way over used…… he is an amazing child….. Timothy has changed everyone is our world for the better 🙂 its great! Eunice: I would say-“your in for the ride of your life, so get ready, you were chosen to be BLESSED! Toni-ann: Go buy a lotto ticket ! Trish Klinefelter Nelson: Get ready to fall in love!! Amy Fulmer Ezell: I would say that GOD only gives special children to people like ya’ll. I have a daughter that is mild to moderately retarded with some autistic tendencies as they say. Really the truth is they said they really don’t know. All I have to say is 16 years later I am most honored to be Summers mommy! I am thankful my friend Crystal Pitts Dearman had Noahsdad.com on her fb. Now I know I am not alone on this Journey with Summer! Maddison Jacobs: god gave you this special little angel ti raise for him you are so blessed . Leanne Perryman: I would say that as hard as those words are to hear initially, you would never take them back because these babies are very special little people who have a little extra something and I’m not talking about the extra chromosome 🙂 you will love your baby more than you can ever imagine. You are so so very lucky. Cindy Ailey Quinn: Fasten your seat belt…you are in for the ride of your life. Sometimes the road is rough and rocky, sometimes it’s smooth and scenic; Enjoy the journey, this child will be the blessing of your life. They will teach you much more than you ever teach them! It’s hard work, but it is so worth the effort! Elizabeth Eddings: I’m a grandmother of a 3 month old DS baby boy. I was divastated, with emotions that is hard to decribe. We all morn in diferent ways. Something would be wrong if we did not. Father and Mother will have their own emotions, feeling like this is a bad dream. Not having control and knowing what to expect. Living Moment by moment will be away of life for awhile.Cry, Cry, Be Upset, You may queston God. But God is always with you. You will make it…Read a little enough to know about SD. My Daughter in law and I felt it was dicouraging and depressing learning the challenges this child may or may not have. You will really not know until baby is born. Find a support group for families with a DS child… God will make a way for you and your family. People told me that my Son and his Wife must be special because God is giving them a child w DS. It has been 8 months now since the news that rocked or world.. My Grandson whom just turn Four a week ago, told his brother Issac whom has DS last night. You are Special Because God Created You Just The Way. I know Isaac already knows what love is…. Time will heal and help you. Soon You, your Husband and Baby will be over on the other side together. Giving and receiving joy and love from each other. Renae Williams: i wld say give ur baby a chance at life!!! you will b plesantly suprised and blessed…the road will be difficult but the good outweighs the bad!!! congrats for being chosen by God!!! Margaret McCormick Owen: I would say that the baby will change your life just like any other child. There will be hard times and joyous times again just like any other child. Raising our son has been hard work and our concern and care for him will go on for the rest of his life. I have two other sons that I can say the same about. Jesse has brought a dimension to our lives that we never had before and I cannot remember life without him. Lisa Landry Crochet; Right now life seems unfair….you will realize real soon you are the fortunate one who gets to look at life through an amazing window.I feel so honored to have this window to look through. Joy Schwarting: Not gonna lie times will be tough, but the good def. outweigh the bad! They are a true blessing from God. Victoria Heether Kolodziejski: I know you are scared but your son/daughter but I can help you find support and resources. It is scary to find out your child will have any kind of disability, but you are not alone. I am here to help you. Penni Cholette: It’s okay to be scared. It’s okay to be angry. To question ‘why me?’. But please remember, it is always darkest before dawn. It does get better. I promise you. The sun will shine again for you. The world will continue to spin. And you will have a beautiful, amazing baby that will teach others more about themselves than they could ever teach him/her. Dawn Loy: I would say – I am so jealous – my little one is 16 and it’s been the BEST time ever! Karen Shutts: You are in for an amazing and joyful ride, with all the love you’ve ever wanted and then some! Laura Quinn Gibbons: Congrats!!! It’s a fun and amazing journey!!! Andrea Jane Matz: Welcome to the most wonderful community ever! You will always have someone there for you, and your child will have so many people cheering them on and celebrating everything they do! Not many parents have that experience with their children. You will work hard and the rewards will be amazing! Congratulations! McCollonough Ceili: This is not the end, but the beginning of a scared souls journey in this world. Sally Nelan Boyd Smile: you’re in for a beautiful ride. Wow, what a list, huh!? We need your help to make this list one of the best Down syndrome resources! I really want to make this list one of the most helpful and encouraging resources available for someone who has just recieved a Down syndrome diagnosis. In order to that I need your help. Will you take a minute to add a comment below with what you would say to someone who just received the news that their child was going to be born with Down syndrome? Don’t worry if someone above has already said it, say it again! The longer the list, the better. Please feel free to share this list on your Facebook wall, email it to your friends and family, link to it on your own site, ask your friends to add to it, etc. I really enjoy finding creative ways to bring people together to create resources like this! So thank you, and I look forward to reading your comments below. Congratulations! It is okay to be scared and angry. After those feelings go away, you will realize what an amazingly perfect child you have and what an amazing journey you are on. congratulations 🙂 i totally agree with another comment never say sorry. there is nothing to be sorry about. Your right! There is NOTHING to be sorry about!! Blessing! God does not make mistakes! The bad thing of having a baby with DS is that you get sad and worried for a moment, when having the news.. the GOOD thing is.. after that you´ll never ever be sad or worried no more.. everything is love, love and more love..It should be named: LOVE SYNDROME. That´s exactly what it is. Congratulations on your baby! Remember you have a baby with Down syndrome, not a Down syndrome baby 🙂 It is OK to be scared, but you will do great! This is amazing thank you for sharing all of these responses. I particuarlly like #30 &#32. I often wonder what I will say to someone that recieves a diagnosis of their child having down syndrome…i might just have to barrow some of these ideas. I had people tell me that I must be quite a special mom to be given a child with Down’s. If you are a believer, be ready to give God the glory! He is the one who gives us the strength and wisdom and perseverance to raise our kids, especially our kids with Down’s. Trust God! He is worthy!! Our son with Down’s is 11 now, and I wouldn’t trade him for anything! I do look forward to heaven, where he won’t have the disabilities that he has now. Then again, in heaven I won’t have the spiritual disabilities that I have now! Won’t that be a wonderful day!!!! The first thing I would say is breathe, everything is going to be ok. My husband and I didn’t know our son had DS until he was born, I too didn’t have the prenatal testing done. I was scared at first because I knew he would have challenges ahead of him. He has been the most wonderful blessing to our family. He is reaching great milestones every day! He brings such joy to our lives. Our marriage is even better than it was before our sweet blessing!!! Always remember God is in control and he will NOT put more on you than you can handle. Almost forgot, you will meet some of the best people through your journey who are genuine because they want to be there for you. I would definitely do it all the same if given the chance! What a wonderful, amazing journey you are about to embark on! My 21 year old daughter has touched more lives than I knew possible. She brings out the best in everyone and does everything to the fullest. Be prepared for a wild, crazy, ride! this list is so true and amazing. i knew nothing of down syndrome before i had my son and found this lovely group of people. i am truly thankful and feel alot of support from all of you. thank you all and best wishes to all. my son is the light of my life and amazes me everyday on how he interacts with his sisters and others. I was so full of doubt, anxiety, fear and hopelessness…for weeks. Then, when my son turned 4 weeks old, he smiled at me. I mean, REALLY smiled at me. A huge, eye crinkling smile. Every bad emotion I had just melted away, and I fell completely, hopelessly, head-over-heels in love with my son. Your baby is just that. A baby. He is unique. No parent wants a cookie cutter child. And you have been blessed with an amazing, perfect, unique baby who will hold you in the palm of THEIR hand. Congratulations. is obtain a driver’s license; think of the insurance savings! A guy my mother worked with totally drove! Me too. One of my colleagues passed her test (and she was my colleague, not the-ds-lady-I-worked-with). She was a great driver and fantastic at her job. Our service users LOVED her, and I mean LOVED HER. They would fight to have her assigned to them for the day. The only thing she was unable to do was write a report at the end of her shift, but she dictated it to one of us and we wrote it on her behalf. I’ve known profoundly dyslexic people do the same. She was everything a carer should be and more and it was a privilege and a pleasure to work alongside her. In Louisiana the DMV says she can’t. BUT she’s only 14 weeks old. So I’m not too worried about it right now. 🙂 We’ve been looking to move to Austin in the next couple of years anyhow. So we should be good! Thanks! It can look black and white for now, but your life will become even more colorful than it was before! you will never believe how many people will be jealous of your baby’s spirit! happiness, love and a peacefulness not found in “normal” babies. So much love. a special baby for special parents God Bless You! My 8 year old son asked me, what’s so special about having down syndrome. I said, babies with down syndrome are very rare, not everyone gets to have one. We are blessed. Then my son said, and mommy they are so cute too. Yup! moved into assisted living homes, some to loss emotionally due to dementia or Alzheimer’s. her [him] any less. It’s human to feel this way and OK to face how you feel. either a special parent or you’re not; God decides that for us. I have said this at times to people (not new parents) – just the fact that I felt like my child had died, and now I had one I still had to take home. I have never meant it rudely, but I have gotten such odd looks from people. Thank your friend for this insight……..it is spot on!!!! 35 years later, I wouldn’t trade a day of this journey, but it was refreshing to read your comment and think “yes, someone gets it”. Thank you!! Wow! It’s great to know someone else felt the same as I did when we found out our Rachel had the “characteristics of Down syndrome” by the geneticists. At first we cried and we were sad and scared…then we held her, looked at her, fed her, changed her & fell in love with her again..by the time we left the hospital, in my mind, I was just so thankful that I got to take home a living, breathing, LIVE little baby. Some people aren’t so lucky. And almost 13 years later, as Rachel walks through the house pretending to be a “Zombie”, (it’s almost Halloween! ), I still feel the same way. Three years ago we took 2-week old Athena in to The Bell Center for Early Intervention in Birmingham, AL. Our lovely director, Betty Bell, told us then, “She’ll be the light of your lives!” And she couldn’t have been more on target! God was speaking to us through her! So proud to be her parents! Congratulations! Your life is about to change in so many positive ways….This diagnosis is a little scary at first because of all the unknowns for your child’s life but it will also be the most amazing journey of love you will ever take. It is a blessed life that few are choosen to be touched by…..enjoy every second of it with your child. The love and joy that my son has brought to all of our lives and families lives is immeasurable and we would not change one thing about him……He is a sweet and treasured soul with so much joy and love to offer! You’re in for the ride of a lifetime. You’ll realize that all is right with the world. Your little one is about to teach you the way life should be lived. Full of love and joy. This is verbatim what one of my friends said to me after Daniel’s diagnosis: “A. Congratulations! B. My sister has DS. And I promise, it is all going to be ok. Better than ok, GREAT. It really is.” It really meant a lot coming from someone who knows what a life with Down syndrome is like. I would pass on the amazing words that my Dad said to me and my hubby when we found out at 20 wks pregnant that Kayla would have Down Syndrome, “God only gives special kiddos to special parents.” Those words have comforted me during many hard times. It’s an amazing journey. Enjoy every second of it!!! I deeply feel your feelings, I was chocked, sad, feeling guilty, and so scared when I recieved my daughter’s diagnosis as well, it was after her birth, although we had some tests during pregnancy but we only discovered this after her birth, I still have some scares and guilts when I think about tomorrow for her, but I totally trust and believe that God will always be with her, the only thing I am sure of is that I do love her more than anyone can imagine, her older brothers, her grandparents, her aunts and cousins adore her, now we forgot about this DS diagnosis and we see her as a very normal and lovely baby, and I totally believe you will feel the same someday. Your present fear will turn into life-time GRATITUDE! I wouldn’t have it any other way. You are the luckiest mama EVER! You already know that that in your heart and soul because you have carried this child for 9 months. So, keep telling your child, “I am the luckiest mama, EVER to have you in my world”. In time, the child’s father (who is not often on board to the trip to Holland) will one day hear your voice and begin saying to your child, “I am the luckiest daddy, EVER!” Eventually, dad’s figure it out, it just takes lots and lots more time! Itis OK to be scared, in time you will see this is a good thing happening to you. He/she will be your teacher.You will learn from him about unconditional love, to live in the present and to enjoy the small things in this beatiful life. You’ve just begun an INCREDIBLE journey. Words don’t always come easily so go to http://www.inspires2aspire.com and see a young man with Down Syndrome who has started his own greeting card business. Congratulations, you will experience more love than you’ve ever imagined! Just to add the perspective of someone who is an atheist and friends with many who follow minority faiths (Hinduism, Paganism, Buddhism, etc), if you are going to make a comment concerning God’s plan, Biblical verses and so forth, make sure the person you are speaking to share your faith. As, while most of us will understand the good intentions behind your words, it does create a bit of an uncomfortable situation for many of us, just as it would for many of you if someone of those minority faiths said, “May the Goddess bless you!”/”May Thor give you strength!”/”Remember the words of the Buddah”/etc. Not trying to nitpick, just popping in to remind everyone we are a world of many beliefs and that should be respected, especially during a time when someone may be going through quite a bit. Couldn’t agree more. I feel a bit uncomfortable if someone mentions God. I had a nurse tell me once just to trust the doctors and Jesus and not ask questions. I think that’s a stupid thing to say. Even those who believe in Jesus must have questions about what happens to them and the people they love when in hospital. I don’t think it was very helpful. What an awesome compilation these great fans have built! You are such a great voice in letting the world know how great ALL kids are! God has blessed you with the greatest love and sweetest innocence on this earth. Congratulations…you will enjoy wonderful blessings on a daily basis! You have been chosen to take care of this angel. And you thought your life was going no where. This angel will take you to place you never imagined possible! You don’t have to mourn anything or take a trip to Holland..There doesnt have to be disappointment.Your plan was to be a parent,nothing has changed.Everything will be ok.
We are excited for you! Even though you may have anxiety now, we believe you’ll soon see this unexpected news is a huge blessing from God. We can’t wait to meet him/her! Let us know if you want to talk about it more. here and can’t wait to meet your bundle of unbridled joy!! There is only one thing to say ” CONGRATULATIONS!! !” And maybe warn them that one day they will sing the Itsy-Bitsy Spider sooooooo much, that their finger tips may bleed..
thankful for this blessing that we didn’t realize we needed. I have an almost 11 year old gorgeous son with Down Syndrome, and he makes me proud everyday to be his Momma… he’s funny, caring, helpful, smart and he has an amazing love that he shares with everyone. He has made me, and everyone that loves him a better person. I know it is scary at first, but you will love him more than you could ever imagine!! When my screening test came back positive for DS, the most amazing thing that anyone said to me was a father who had a two year old daughter w/ DS. He told me that if there was a cure for DS that could make his daughter what everone else thought of as normal, he would not allow her to have it, because she was already perfect in every way, no matter what anyone else thought. The way that he loved his little girl, looked at her, held her, and played with her reassured me that this dx was a blessing! God has blessed you with a gift of “LOVE” that is beyond words. Everyday you will find new and exciting moments filled with love, smiles, and happiness. Enjoy every second!!! A Trip to Holland By Emily Perl Kingsley I am often asked to describe the experience of raising a child with a disability — to try to help people who have not shared that unique experience to understand it, to imagine how it would feel. It’s like this… When you’re going to have a baby, it’s like planning a fabulous vacation trip to Italy. You buy a bunch of guide books and make your wonderful plans… the Coliseum, the Sistine Chapel, Gondolas. You may learn some handy phrases in Italian. It’s all very exciting. After several months of eager anticipation, the day finally arrives. You pack your bags and off you go. Several hours later, the plane lands. The stewardess comes in and says, “Welcome to Holland!” “Holland?” you say. “What do you mean, Holland? I signed up for Italy. I’m supposed to be in Italy. All my life I’ve dreamed of going to Italy.” But there’s been a change in the flight plan. They’ve landed in Holland and there you must stay. The important thing is that they haven’t taken you to a horrible, disgusting, filthy place full of pestilence, famine, and disease. It’s just a different place. So, you must go out and buy new guidebooks. And you must learn a whole new language. And you will meet a whole new group of people you would never have met. It’s just a different place. It’s slower paced than Italy, less flashy than Italy. But after you’ve been there for a while and you catch your breath, you look around. You begin to notice that Holland has windmills. Holland has tulips. And Holland even has Rembrandts. But everyone you know is busy coming and going from Italy, and they’re all bragging about what a wonderful time they had there. And for the rest of your life you will say, ” Yes, that’s where I was supposed to go. That’s what I had planned.” And the pain of that experience will never, ever, ever, go away. The loss of that dream is a very significant loss. But if you spend your life mourning the fact that you didn’t get to Italy, you may never be free to enjoy the very special, the very lovely things about Holland. Thias peom brings tears to my eyes, EVERY TIME I read it. I would definatley say that a new parent of a child with DS needs to hand this somewhere that they can look at it from time to time. My husband and I had a chance to meet Emily Pearl Kingsley, the author of this poem, and she told her story of when her son was born and the flowers on the wall next to his changing table and all the doctors being so negative about her keeping him. And she told about how a case worker came to her and said..it may be far fetched and seem impossible but if your willing to try it out, there is this new thing called….Early Intervention. And her son has now written his own book with a friend and Emily is the writer of the “special needs segments” on Seseame Street!! She autographed our copy of the peom and we also have “baggage claim tickets” that read Originating to…Italy, Destination….Holland. We mourned for quite awhile and I do look back now and think WHY? Our 25 month old is amazing and he is such a joy in our lives..and the best thing- I love how (since he is our last child) I can enjoy those milestones longer! He just started walking and Ive loved how long it has taken because kids grow so fast, that you will soon forget those small details. Please know, things will get better than you first thought…love your child just as you expected to anyway. DS is not a diagnosis, it truley is a blessing. You are about to have an Angel born into your family! That us what I would tell someone, my aunt had Down Syndrome and she was the sweetest, kindest best friend I ever had. God puts people like her in earth to teach everyone exactly how to love and he only puts them into the lives of people who He knows is strong enough to take care of one of His own. A dear priest friend said to me, the grandma: “God is revealing himself to you in a whole new way.” This has been so true…little William gives us so much love and increases the love we have for each other too! Congratulations! Another way for God to show that he doesn’t make mistakes , but he only make masterpieces. Welcome! You have found that path you always passed by and said “hmm! I wonder where that leads?” Well for all of us it is a slightly different experience but it leads us to the same conclusion. It is one filled with a kind of love that empowers you from within. Beware though it is a bit bumpy but well worth the ride. Just take each day one day at a time and you will soon see that God gave you your very own angel. You know what? EVERY milestone you complete will be sweeter and the world will be so much richer for you when you experience life threw your child’s beautiful eyes. Congratulations ! If there’s anything you need just ask. Rick Smith, thank God for giving you Noah and thank you for what you are doing. What a great way to start the journey – with the right words and mind-set. My doctor in Evanston, IL, told me something that made me feel that there was nothing to worry when I asked him what it meant to have a baby with Down syndrome. He said “She is just like any other child. She just has an extra chromosome in her cells”. Then, he gave me a list of the early intervention agency and Gigi’s Playhouse – a Down Syndrome Awareness Center in Chicago. Now, I’m back in my country and paying it forward by setting up a special needs awareness center to help parents get a head start. When people come in, I tell them how cute the baby is (just like what you would do to any baby), they can see Gabrielle and know that four years down the road, their child will be able to do the same given the love, care and early intervention. What a blessing, indeed!!! In my country, not so many people read English and mostly Budhists who felt that having a child with challenges is the result of their karma in the past. We are trying to help them look forward and move on. May I translate some of the comments and post on The Rainbow Room’s site and few other local DS support site to help others? Names of contributor and the credit will go to Noah’s Dad, of course. Once again, my great admiration for your work. Your family is chosen. Praise God!!! Like others have said, it’s ok to mourn the child you *thought* you were having. Go ahead and say goodbye to that child. Then say a big hello to the child you *do* have because he or she will amaze you every day! You will not take life for granted, every day will be an adventure, and every milestone however small will be celebrated. There will be doubt, fear and challenges. Just like with every child. Educate yourself, educate others, be your child’s best advocate (and you may find yourself advocating for everyone else’s child too!) and dump anyone who says your child “can’t, won’t, will never” (and that includes medical professionals who should know better). It’s not a club I ever wanted to join, but now that I’m a member I wouldn’t change it for anything. My son is 10 now and as his unaffected twin brother said when they were 4 “I think he got the extra chromosome from me so we could always be together no matter what.” Whoever called it LOVE Syndrome was right on. When a person is diagnosed with an illness or disability at some point in their life they do not immediately become that illness or disability. It does not define them. When I had my daughter I was completely unaware of her diagnosis before her birth and I was not going to believe it until the test came back positive. I am a nurse and I was completely disgusted by the way DR’s teach by the negatives, telling only what might not be. I was not willing to listen. I am glad. My daughter is Cadence Moran, she is not Down Syndrome. She walks, runs, plays, she communicates, she laughs, she sings, she annoys her sisters, she throws tantrums, she loves and she is loved. She will grow up and she will have the opportunity to persue the things she wants, she will live on her own even if it is in a group home. She will go to prom, she will have crushes, and as an adult she will love and be loved. No one can tell me what she will and will not do, no one is going to decide on her future but her. My daughter is Cadence Moran and she is LOVE, she just happens to have Down Syndrome. Almost 14 years ago the woman who has become my dearest and closest friend had her fourth child. I knew that the family was expecting a baby girl and quite excited. After the baby’s birth I heard my now friend speaking with someone in the post office. The discussion was about when the baby would be having surgery. As the mother of a toddler who had already had about 10 surgeries, I spun around and wanted to know what was wrong the baby/ My friend told me the baby had Down Syndrome and the associated heart condition and would need surgery before she was 3 months old. My heart broke — not because of the DS but because of the medical complications and impending surgeries. I probably did not say the “right” thing but all I could see was her parents putting the baby in the arms of a nurse in scrubs, so I just said, ” I am so very sorry. What can I do to help you?” My friend understood my words and concerns. Sometimes it isn’t the exact words but the love behind them! I think it would depend on when the parents found out and what their reaction was. I don’t have a Down Syndrome child myself, but I have worked with a lot of people with an extra 21st chromosone. I can honestly say, my life has been better because they were in it. I’m the lucky one. I’m not religious myself, so wouldn’t be comfortable mentioning God. If the parents were ok with it, I would say the same as I do to all new parents – congratulations. If they weren’t, I would say “You have a beautiful boy/girl. You might be on a different journey than the one you thought, but it’s going to be a fantastic journey. That hasn’t changed. It’s ok to acknowledge that you wanted something different for your child, but your child is no less beautiful, no less special and I know will be no less loved. You’re going to learn so much from your child. I hope you enjoy every moment. I have no doubt that you will. Congratulations on the birth of your beautiful baby”. Allow yourself to grieve. Allow yourself to rejoice. You will love your baby and your baby will love you. Congratulations and Welcome to this amazing journey! Ooohhhh boy, not all r cut out 4 that. Hope u make it thru. How is that supposed to encourage and help a parent who has received a Down Syndrome Diagnosis? Thank you so much, this web site has been an inspiration to me and has helped me find the light at the end of the tunnel. It is nice to know that I am not the only person in the world going through this or feeling the way I do. It’s great to see such a support network is available, and to know that there is always someone to talk to if needed. Thanks for the kind words, I’m glad you found our website. Do you have a child with Down syndrome? If so how old are they? The day our Taylor was born was a complete rollor coaster. As the doctors rushed our little girl to the nicu my husband and I was a complete mess. I kept telling my mom and my husband I never heard her cry why isn’t my baby crying ? My husband RAN to the nicu and the doctors walked him back into my room . The doctor told us our little girl has down syndrome and some other medical conditions. My heart broke into a million pieces. We had our whole family plus all our friends at the hospital waiting for our daughters arrival and we had to face everyone and tell them. Well my husband and I decided that we needed to tell our parents first then they can tell everyone in the waiting room. When the doctor told our parents my dad walks over to me and kissed me on my forhead and told me not to cry that his baby girl will still be his fishing buddie. That moment forward I didn’t cry but rejoice what the Lord has givin me. How lucky was I to be special enough in God’s eye’s to give me a baby that he made fearfully and wonderfully made!! God does not make mistakes and he choose each parent wisely! I will forever be grateful to my Dad to open my eyes and show me that she was perfect no matter what and with my family and exceptly with God All Things Are Possible!!! The thought of my baby girl having down syndrome never crosses my mind. She perfect just the way God made her! New parents out there that has a baby with Down Syndrome remember Down Syndrome is only a medical term and it does not define your child. It’s the way you will raise your child in believing that your child is fearfully and perfectly made. God never makes mistakes 🙂 And they will always be your fishing buddy!!! Hi Rick! Thanks for this amazing resource. I hope it is ok with you that I share this link on a new blog I created called, “Supporting families diagnosed with Down Syndrome”. I see you have a ton of resources as well and hope to add your page, http://www.noahsdad.com to the list of resources for parents, families and friends. Our best friends’ baby was diagnosed with DS about a month before birth. She’s here now and Phoebe is the most amazing person in the world. My partner and I felt, and still do at times, uneducated on how to even speak with them about their diagnosis. This reference was given to us and we have launched from there. Thank you for being here to support us supporting our friends with the best and most beautiful addition to their and our lives! My baby is forty days old today. During this period I have visited almost hundreds of web sites about DS. Some are helpful and some terrifying increasing your anxieties. Noahsdad.com is the most beautiful ,colourful and helpful website. It will remove pain from your heart and make you light heart. No doubt there are challanges to raise a child with DS but still a child is a child he will make his place in your heart and your life will be normal again. Just pray to God may he help you and make things easy for you. I don’t have a child with downs but I’ve found that the children and adults that do have it are the most loving people in the world. I honestly believe that those who do have a child with downs are the most blessed people in the world because god entrusted them to raise his little miracles of absolute love. They should feel blessed. Acknowledge and accept your grief for the baby you were expecting. The sooner you get that out of the way, the sooner you can accept your child for the beautiful being that they are. And your child is a Gorgeous Soul with a unique gift to share with the world – starting with you and your immediate family. My special needs son has been an inspiration and made me a better person in ways I don’t know if I could have experienced any other way. My sister’s DS child has done the same for her. Yes, it is hard sometimes and sometimes you feel alone and isolated from the parents of typical kids who may not understand the particular challenges and the kind of life long commitment a special needs child deserves. Be angry and sad and whatever other “negative” emotion creeps in when you thought you had accepted everything about your new life. Then remember you are not alone. You have the chance to really learn how to accept your child for who they are and what they can accomplish in a way not everyone is challenged with. And you can get used to anything even dealing with delayed potty training or no potty training because you will love your child more than you can imagine. You will be a stronger person for loving your special child as he/she opens your eyes to a new world. Love and Hugs! Call when you need advice, a shoulder, to vent or any other cars on the rollercoaster you need someone to join you on. The world is a better place because (name) is in it! I’ve got my sweet Chloe who is just 3…she has brought more joy into our lives than we could have ever imagined. she is the youngest of 5 kids and she it totally adored by all. i’m not even worthy to have received such a blessing. Thank you God!